LADWP staff are pictured with representatives from City National Plaza, which won a first place award in the Energy Efficiency category at the LADWP 4th Annual Sustainability Awards. LOS ANGELES (April 4, 2019)—The Los Angeles Department of Water and Power (LADWP) hosted the 4th Annual Sustainability Awards at LADWP’s Headquarters, the John Ferraro Building in Downtown Los Angeles, on April 4 to honor businesses and non-profit and government agencies that made significant efforts to improve sustainability of their operations or facilities. “Through their commitment to sustainability, these organizations will conserve an estimated 57 million gallons of water and reduce CO2 emissions by 23,000 metric tons annually. We need partners like these to serve as examples for others. It is our hope that more organizations can follow their lead by participating in the many programs LADWP offers to help costumers save water, electricity and money. Their actions are not only good for the environment, but also their bottom lines,” said LADWP General Manager David Wright. The combined water saved by the honorees is enough to supply 524 single family homes in Los Angeles on an annual basis. The combined carbon emissions avoided is equivalent to taking nearly 4,950 cars off the road. Awards were presented to 21 non-residential customers in five categories: Energy Management, Water Management, Transportation Electrification, Renewables, and Demand Response. City National Plaza reduced their energy use use by nearly three million kilowatt-hours (kWh) through participation in LADWP’s Commercial Lighting Installation and Custom Performance programs. This reduction prevented more than 1,000 metric tons of carbon dioxide. Union Pacific Railroad replaced 1,050 lighting measures by participating in the Commercial Lighting Installation Program to save 2.7 million kWh. The California Science Center implemented numerous upgrades of interior and exterior lighting, a direct digital control system, and HVAC upgrades to save 2.6 million kWh. Union Pacific Railroad Company participated in the Commercial Lighting Incentive Program to reduce their annual energy use by 55%. The USS Iowa Museum participated in the Commercial Lighting Incentive Program to reduce their annual energy use by 38%. Avibank MFG., Inc. also participated in the Commercial Lighting Incentive Program and reduced annual energy use by 26%. Non-profit hospital Cedars-Sinai installed a groundwater treatment and re-use system that saved an estimated 23 million gallons of water annually, enough to supply more than 200 single family homes a year. Kaiser Foundation Hospitals installed plumbing controls that saved 19.5 million gallons annually. Air Products and Chemicals, Inc. implemented a reverse osmosis system that saved 15.6 million gallons. Meggitt, Inc. was awarded first place for installing a new cooling tower that reduced their water use by an estimated 38%. The Museum of Contemporary Art installed an atomized water system to reduce waster use by 26%. Los Angeles Center Studios installed a new cooling tower that reduced water use by 17%. Property Owner Shelly Sterling installed 68 electric vehicle chargers at seven properties. The Los Angeles World Airport installed 53 chargers at six parking facilities. The Los Angeles Department of Transportation installed 51 chargers at 11 locations. 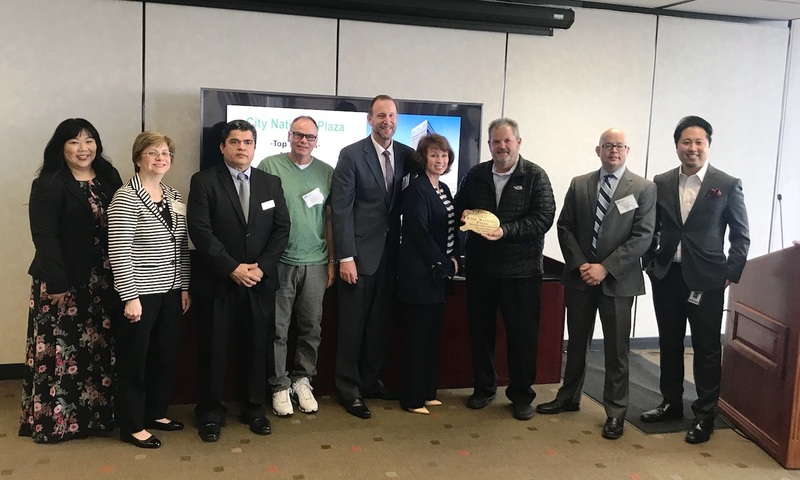 Westfield Topanga and the Village took first place for installing a 2,275 kilowatts (kW) solar installation through LADWP’s Solar Incentive Program. The Kaiser Foundation Hospital installed a 2,052 kW solar installation. The Los Angeles Convention Center installed a 1,977 kW solar array, which is the largest such system on a municipally-owned convention center in the United States. Los Angeles Unified School District, which was honored for the second year in a row, implemented demand response practices as part of the Summer-Shift program. This action reduced energy use and avoided approximately 5,964 metric tons of carbon dioxide emissions. Anheuser-Busch also honored for the second year in a row, reduced energy use by 8,559 KW to avoid approximately 4,913 metric tons of carbon dioxide emissions. LA Live reduced HVAC usage and lighting loads facility-wide to reduce use by 6,300 kW to avoid approximately 3,665 metric tons of carbon dioxide emissions. The Sustainability Awards is a unique event that recognizes LADWP’s largest customers for their sustainability efforts, which due to their size have a major impact on water conservation and electricity use. The goal of the program is to increase awareness of sustainability best-practices and how they can benefit organizations, the environment and all stakeholders in the City of Los Angeles.